This past season, Will Schneider set the Kansas high school record for career passing yards. Now, the Shawnee Mission North quarterback has another accolade he can add to his already impressive resume. The Get Busy Livin’ Foundation, along with Kpreps.com, announced that Schneider has been named the 2016 Dylan Meier-Get Busy Livin’ Player of the Year. 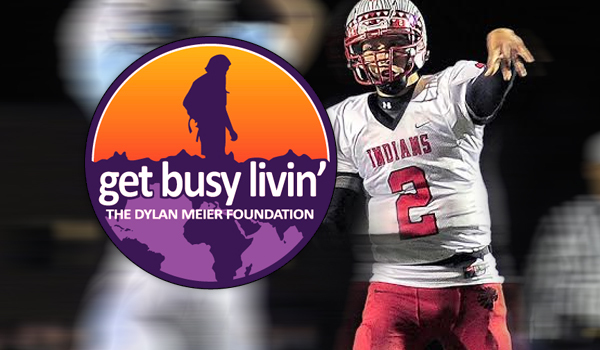 The annual award, which is in conjunction with the Get Busy Livin’ Foundation, is in honor of Dylan Meier, a former All-State quarterback at Pittsburg High School and starter at Kansas State University who died during a hiking accident in 2010 at the age of 26. The award goes out to one Kansas high school senior who not only has shown excellence on the field but also has demonstrated the values that Dylan embodied and Get Busy Livin’ strives to promote: adventure, fitness, curiosity and a daily zest for life experiences. A four-year starter at quarterback, Schneider finished his high school career with a state-record 8,901 yards. As a senior, he threw for 3,035 yards with 31 touchdowns and only seven interceptions. He was a finalist for the Simone Award, which recognizes the Kansas City Metro’s top player, and he is committed to play football at NCAA Division II William Jewell College in Liberty, Mo. The career passing record is something Schneider said he and his father made as a goal when he entered high school. Schneider also is a member of the student council and the school’s theater department. In both groups, he participates in various charity and youth-focused activities throughout the school year. He also helps coach his younger brother’s youth football team. The other finalists for the award were Mill Valley’s Joel Donn, Osborne’s Cullen Grabast, Pittsburg’s Elijah Harris, KC Turner’s Jordan Martin, Fredonia’s Isaac McPherson and Frontenac’s Brandon Mlekus. Players from each classification were originally selected as candidates based on exceptional on-field performance. Coaches were then solicited for information about the players’ character, school performance, community involvement and hobbies. From those submissions, the GBL Foundation narrowed the group to seven finalists. Each finalist answered a series of questions. From the questions, the Meier family and the GBL Foundation Board selected a winner. Past winners were Rossville’s Tucker Horak, Bishop Carroll’s Denzel Goolsby, Shawnee Mission West’s Austin Chambers, Lawrence’s Brad Strauss and Madison’s Kole Schankie. In addition to the award, the GBL Foundation distributes several scholarships surrounding Dylan’s hometown of Pittsburg. The seventh annual Get Busy Livin’ Dylan Meier 5-kilometer run will be April 29 at Hutchinson Field in Pittsburg. For more information about the foundation and the event, go to getbusylivin.org.